I just came back from My Saddle Brook Farm not too long ago. 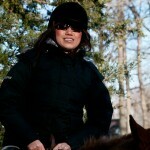 I had my second horseback riding lesson thanks to Westchester Magazine’s Deal of the Day. Initially I slowly rode several times around their corral and with the supportive nudge of my instructor, Helen, even had the horse trot a few times. 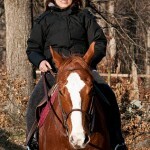 Hudson (horse) and I eventually went on a gorgeous scenic fall trail ride with Helen and my husband alongside us! At the end of the lesson she asked me how I felt and I honestly told her the experience exceeded my expectations because that’s what it did. I thanked her for encouraging me to go on the trail ride. Lord knows how long I would have taken to dare broach the topic on my own. 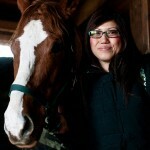 Today, my school horse was a handsome and sweet fellow of 11 years and a thoroughbred who previously raced in Canada. Through mud and rocky trails, Hudson endured for an hour long lesson and more than earned his carrots and Red Delicious from me. 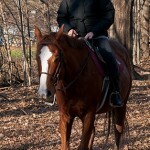 Despite his vices of cribbing and wood-chewing he’s still a great horse companion. There’s no feeling in the world like being on a horse. You forget all your worldly cares and troubles really. You can finally leave these things behind. I equate the experience to going fishing in a quiet but lovely lake community- just you in a boat with food and drinks. I have a second lesson left as part of the package deal and I’m happily anticipating it.